Today we are introducing Canvas – a native blank page template in Elementor. Canvas works with any theme, and lets you design the entire page in Elementor. No header, no footer, just Elementor. Elementor is certainly one of the fastest tool for creating landing pages. Nevertheless, until now, there has been one consistent problem when creating landing pages – Removing the header and footer. I am happy to announce that from now on, you no longer need to struggle to remove headers or footers, or install any plugin to remove them! To implement the Canvas template, go to the WordPress page dashboard, and in the page attribute box, under template, choose the Elementor Canvas template. Now edit the page with Elementor and you will see the full page inside the editor. Another way to set the Canvas template is through the newly added Page Settings panel. This makes for a smooth transition to presenting the second feature we are adding: Page Settings. Today’s release comes with a new set of options, called Page Settings, that lets you control some very basic and useful settings in the page from within Elementor. This means you no longer have to go back to the dashboard to change the title, change templates or even publish the page! This settings feature is a great advancement in helping you do more right from the Elementor Page Builder, without having to go back and forth between the dashboard and the editor. Change the background of the entire page, and choose a color, image or gradient background. You get all the customizations options you normally have for image and gradient, so you can set it just right. You can also set padding for the entire page, very handy for creating an extra space around the entire page. If you have a page with a large image background, for example, you can use the padding to frame your content and show more of the background. The Post Status setting lets you publish the page you are currently working on from within Elementor, without having to return to the dashboard. You can also set the status of the page as draft, pending review, private or published. As mentioned before, you can set the page template of the page as Canvas from within the page settings, or set it to any other page template that is available on your WordPress site. Another useful option we’ve added to Page Settings is the ability to hide the H1 title of the page. Previously, you had to use CSS, code or another plugin to remove the title. Now, you switch a button within Elementor and the title is gone. This feature hides the title using the default WordPress H1 selector (h1.entry-title). This is the selector that themes most commonly use for the page title. If, however, your theme uses a different selector, you can go to the Elementor dashboard and customize a different selector name, so Elementor will still be able to hide it for themes with different title selectors. Besides hiding the title, you can also customize it from the Page Settings, without having to go back to the dashboard. Just enter the new title, and it will instantly be seen on the page. Elementor is growing not only as a builder for pages, but for blog posts too. Drop Cap is a feature that is mainly targeted towards Elementor blog posts, letting you make the first letter of your text editor widget a drop cap (Extra large first letter). This is a very useful feature and is widely used in various written formats, both online and offline. You’ve probably seen it in used in blog and magazines article as well as in books. Check this feature out in the Text Editor widget. We have added an error catcher for the editor, so you can easily understand compatibility issues and conflicts with themes, plugins, server configurations and addons. We have also added a new ‘Maintenance Mode’ feature to Elementor, making it easy to switch your site to Under Construction or Coming Soon and create Maintenance Mode pages using Elementor. With this feature, you can set your site to Maintenance mode, and build your site without your visitors seeing it. If you pick Maintenance mode, the website will return an HTTP 503 response to visitors and search engines, meaning the site is temporarily down for maintenance, come back later. If you pick Coming soon, the website will return an HTTP 200 response to visitors and search engines, meaning the site is indexable. We will publish a more in-depth look about this feature in an upcoming post. 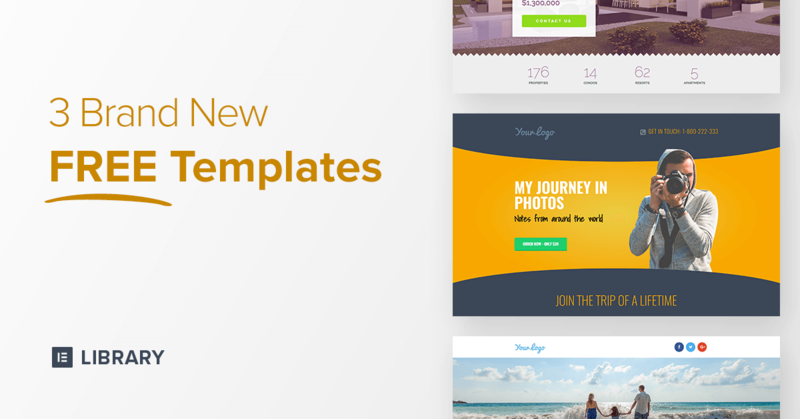 To help you get better aquainted with the Blank Canvas template, we are releasing 3 new FREE landing page templates, that already come built-in with a logo placeholder and a social icons menu. These templates also showcase the recently added Shape Divider & Gradient features. We recommend testing out these new templates, and seeing how much easier it is to create a landing page with the Canvas page template. In this version, we put the focus on making Elementor a more stable page builder, with better compatibility to other plugins and servers. We also made an effort optimizing the code, making everything faster. We strive to improve the designer workflow, and have added some interesting new features that are directed toward the more heavy and professional Elementor user. Users who work with Elementor on a daily basis. I’d love to hear what you think about these features. Please add your thoughts in the comments below. Keep up the great work! Love this builder. Silly question, but where can we download Canva? Thank You! Been hoping for this!! Menu options? Looks awesome, Ben! Awesome! I’m so glad to see this natively supported. And all these other features make this a great all-in-one page building package. I’m glad I’ll be able to disable some other plugins and also recommend Elementor for launch and maintenance pages! Yeah, the maintenance mode feature can really help a lot of users. Elementor is going to be great(er)!!! More features for the Pro users,please! Right now I’m feeling a little bit bad that I’ve paid, and there are almost no special goods for us! Wow you guys are…. simply amazing I knew i had to pre order when you guys released pro version and I was right to do so… I mean wow! Great job! I have a quick question tho will elementor implement third party email software API keys for like (aweber or mailchimp) in the contact forms so we can use it for our email marketing campaigns? Truly awesome, thank you Elementor! If a Menu Widget is made some day (including Woo Cart) no theme will be needed ever again! In the Global Fonts I would like to not only set the font face but also default size for all H1 thro H6 tags and for P – so you can set the default typography in one place. And change it site wide in one place. Column widths as a number not just dragging about. You guys are adding some great features, thanks, and keep up the great work! I’m really looking forward to the autoresponder integrations. So glad to have discovered Elementor. Adam over at WPCrafter has to take credit for getting the word out. You guys rock. Thanks much. Merci pour cet ajout. continuez comme ça ! Great ! The best builder has become even better. One question though : how do we get the upgraded (Pro) version ? Great stuff again! One thing I’m running into lately is a repeated need for content sliders, and it’s one of the few things that’s not really provided for in Elementor yet. Hopefully that’s something that could go on the to do list at some point! Something that would allow us to have columns containing any content within a slider container controlled by the usual arrows/dots, with options for columns to display at once, columns to slide per pagination click, and responsive options (eg: 3 cols on desktop, 2 cols on tablet and 1 col on mobile). Without header/footer where does one add the Facebook pixel on a lander? All the footer and header scripts still load. Unless you manually add the FB pixel to your footer.php or header.php page, it should still work. ¿Seria posible que en una nueva actualización de Elementor, el carrusel tuviera la opción de ser en también en orientación vertical? Remember to use Google translate from your native language to English. Would it be possible that in a new update of Elementor, the carousel had the option to be in also in portrait orientation? You’re fantastic! Update very useful and necessary! Thank you! You are my heros! Thanks a lot. Does this mean that with Canvas, we can create a new site without installing any themes? You will need to install a theme. Thank you for all the hard work. Elementor really helps with developing my web design business. Not all websites have to be custom theme, programmed from scratch, not all clients can afford that, so Elementor is helping me take on clients (the little guys) besides big projects. I can deliver a fast turnaround and also cool looking websites! It’s really really great!!! *One thing I want to mention is that Elementor really needs a Section, Column selector in the customizer area not only in the design area, I have problems selecting the section or columns when i use negative margin. Great additions today, keep them coming. Look forward to further additions. Hopefully in the near future you might be able to include popup text bubble when hovering over images or text! Did Drip make it onto this list Ben? With the ability to add / remove tags? May I create my own custom global menu and apply it to the pages I will create ? Elementor has got to be the best plugin I’ve ever seen. Great work folks! Is there going to be an update in the future that allows the ability to customize the posts page? Or is it already in place but I just missed it? Hello, Ben Pines, it’s really amazing what Elementor gives us designers and agility too … see the work I did http://www.telsoamorim.com.br/maisfibratelecom/ the customer is very satisfied and happy because The site is within the standards of exigencia, very beautiful and totally responsive to the movables. Congratulations and continue the beautiful work. God bless you all. Is there a limit to the number of columns? I am very excited about this page builder. Everything is so clear that it is very easy for beginners to create a homepage according to your own ideas. I have tested some PageBuilder and this is really the only one I can work with (as a beginner) and quickly get started with my website. Thank you for your really GOOD WORK. I’m so glad to read this! Elementor is the best thing out now. Great job! Is this out now? How do I get the new features? I updated it on the plugin page but I don’t see the new changes. Also, will there be a future option to be able to customize the blogs post page? That would be awesome. I included a link, just read about it. It lets you add blog elements. Elementor is built by the company called Pojo. Excelente trabajo. Muchas gracias. Cada vez que realizan un agregado o corrección es realmente genial. Sigan así. WOW, WOW, WOW, you´ree really great. Elementor becomes to the best page builder ever and I want to go this way with you. I only use Elementor now for all sites I create and I´m looking foreward to the next great features. I love elementor!!! This feature only for Pro? This is great news. But which are the new templates (basic and pro)? Also, some suggestions: 1. I agree with Andrei above: we need the section/column elements in the palette of elements, not just in the design area; it is difficult to add a section back near the top of a long page without duplicating an existing one. 2. It would be nice to have a page template which is header (from theme) + blank content + blank footer; perhaps I’m wrong, but I don’t think I can do a header/navbar fixed on scroll just using Elementor, although that would be a great element to have. Look forward to more from you to add to an already great product. Tank you Ben. I was able to find it in the elementor canvas. I’m just wondering. Will the page settings feature be available for the default template as well? Hi, do you have tutorials about extending Elementor? Great new features! Keep them coming. I have already ditched Beaver Builder for Elementor! I guess I am dumb. I can’t find a way to select Canvas> I can’t find anything labeled page attribute box. I am using WP 4.7.3. Also where are the 3 free templates. There is nothing in my Elementor 1.40 Library. Can you please help with “Elementor for Dummies”? Ok, I found where to select Canvas. However, when I experimented using it on my home page, all content was lost. I changed the template back to default. but the content of the page except for a sidebar. Had to do a restore to get my home page back. It would be nice to have Canvas fill the page with everything on my home page and let me edit it instead of having to recreate it. This seems like a specific problem you are facing. Contact our support and we’ll try to assist you. Please add nice timeline (vertical and horizontal )widget to present company history. Thanks, I will contact them. I also suggests for the first users of elementor use tools like clientonboard. For me it was very hard to find way to change background photo. So for me elementor should be not only webbuilder but webbuilder that build business. Really like your builder. It’s far quicker and simpler to use than many other builders I’ve tried. One thing that is lacking which is really important when it comes to SEO, is the H1. It’s great that you’ve built in the new feature to hide the H1 tag but this is only done by making the H1 selector display:none. The problem with that is Google will still see the text in the H1 tag in the page source, so when I go to create another H1 using Elementor, the result in the page source is more than one H1 tag which isn’t good. I’ve spent ages trying to find a WP plugin which will remove the default H1 completely from the page source as opposed to simply using display:none;. Would this be something you’d be able to update in the next version? It would be incredibly useful!! Elementor Team: If you do decide to do this, please only make it an *option* for it to remove the H1, as some may want to keep it as is. It should be flexible and not force people to go one way or the other. Thanks! How about ability to create header and footer on elementor on sitewide? A timeline portfolio would be very useful for artists, guys. Something like this http://rickriordan.com/ Something fluid that, at the same time, breaks with the corporate look. It would be a great add for Elementor Pro. Thank u! Keep up ithe good work. We appreciate you. Oh one more thing. Can you look into adding a site wide Header and Footer design? A 3rd party plugin Stylepress does that, but I’ll love it added by default into Elementor. Can you believe I use Elementor for Wireframing? Will there be a menu widget anytime soon?? I hope to see some nice new updates for elementor pro, any hints of what’s coming would be nice. Great work again and thank to your entire awesome team! what has happen and how can i fix it ? Hi. Why I cant change color, size of the paragraph text with help of the Elementor? I use appointment theme. Thanks. But my theme do not allow me to do it( I can change color of headings, etc, but text is not changed! Try to switch themes and see if this solves it. Also, try to deactivate all plugins. I can’t figure out how to add a comment section? There are pages I’m happy to leave in elementor canvas, but I need comment sections on those posts for my readers. Eu estou feliz com Elementor parabéns a equipe. Can you save a blank Elementor Canvas page as a Template for future use? I’m hoping this isn’t too obvious, but I can’t see how to remove an entire template once inserted in the page. Can you do this with one click? Love Elementor, by the way! Thank you Ben – Elementor is awesome! How to add canvas visual hover ? Estava esperando muito esta função. Eu havia até criado um plugin pra suprir isso. Mas agora é desnecessário. Parabéns e Obrigado! Hey guys – is there a way to keep my secondary menu and primary menu areas and just edit everything below them? I started using Elementor on the blog and I’m enjoying it, it has enough resources that help a lot, so I’ll do some new work. Thank you to the entire Elementor team. I would like to know how to use the categories of the own worpress to be displayed the native posts and pages of wordpress for the slides, news, popular, recent, posts categories, pages, wherever I want to put it, be it in header, body, sidebar or No footer. Because I use a lot for news site and everything is directed to the categories and pages that are made in wordpress. do you have elements to add menus? i hope you can add that to your list, but i find it very useful I’m about to purchase the pro version, I’m just learning it first. Hi guys, how can I edit the canvas.php if I want to keep the plugin with updates? Can I put the file into my theme folder in some way? Tried to create /elementor/page-templates/canvas.php inside my theme folder with no success. mh. why is my comment here? :0 I have the same problem as Amanda Bowers. I want to add a comment section. Is that possible? How does one spell check in Elementor. I go into WP Editor to spell check and attempt to return to Elementor and it does not retain settings. Quite frustrating. If the header scripts still load, why aren’t the scripts I put in the header.php file showing? First of all Appreciate the developers of Elementor. Let me come to my thought. Is it possible to Create a Theme With Elementor and Export as an Individual theme, and use that theme can be used for any WP site even with out Elementor . I mean Creating an Independent theme. Thankyou! I am loving Elementor so far – it seems brilliant. I am having a little technical issue though, how do I move the ‘paragraph’ text box from the main page so that I can edit my home page photo? what’s the difference between “Elementor Canvas” and “Elementor Fullwidth Blank”? It is the best builder I’ve come across and I love it to bits. It’s easy to use and help is always on hand. Keep bringing it on! Hello, I would like a help, in the page that I created with the “Elementor” is showing the message “Your cart is currently empty.”, I would like to know which file to change, to Portuguese, The site is http: //validayserver. Your Name: Thanks in advance. Is there a way to add the Header and Footer to the blank canvas? I am trying to get a blank page with only the header/footer and menu but no sidebar at all, The blank canvas would be perfect if I had the header and footer..
I’m using a child theme to have any additional code written in the header.php from the child theme (like Analytics code, Facebook Pixel, hreflang-tags). Whenever I use the Elementor with header and footer from the theme it’s al nice. But whenever I’m using Elementor Canvas it doesn’t pull the codes from the header.php. Can you add comments to an Elementor Canvas? I’d love to know how to add comments to the Elementor Canvas. I’m loving it so far and that’s the ONLY missing piece! Im Wondering is there any possibility to set Elementor Page template as Default Page template for pages, posts and custom post types ? Same question as Kannan. Would really like to be able to set a default elementor template for a post type. Is that doable? Seems almost a “global” feature. Would happily upgrade to pro to get it, too. Hi Guys! I’m very pleased using elementor. It’s an amazing builder, very intuitive and fast. Thank You for the effort! I ‘m wondering if there’s a way to use the elementor canvas keeping the original header and footer visible. If so, I wish to know how. I just installed Elementor, There is no “Page Settings” as shown above (only Global Settings and Dashboard settings) so I am stuck with my custom themes header, footer and side bar. This was more so an an attempt at creating a single landing page for me. Is this now only available in the Pro version? I am willing to pay for it if so just don’t want to buy it to find out it is just a problem with my theme. Hello, Y installed elementor with theme ocean wp. Now al over the website has on every page duplicate h1 and h2. I try everything but cant find any solution please help. The same question; Elementor Page template as Default Page template for pages, posts and custom post types? Hello Ben, I use elementor header and footer builder and have noticed that the footer is not removed when I use Elementor Canvas. Would you happen to know how this can be resolved without me having to rebuild my footer internally? The Canvas template removes the footer. If yours doesn’t, maybe something is wrong with your theme. Hello Ben, I have an online store, made with elementor pro + generatrpress. The product cards were with elementor canvas, to personalize them. And it has not worked for a while: you can see the default page of the product + the designed page. Do you know what must happen? I am having the same problem as above, I set it to Elementor Canvas before I began customizing, but the page header and footer are still being shown. It shows correctly in the “preview”, but when I go to my website in an incognito window it shows up. I am using the common Astra theme. Are there known issues with Astra? Same problem. when a choose elemntor canvas, header and footer stay…and templatemonster support doesn’t want help me. This option is FREE or PRO feature ? Templatemonster support say to me that is pro feature but i know that is free version. Thanks for this confirmation. I have always the sale problem… templatemonster dont want help me. is it possible to extend the Canvas Page ? I would like to be able to pre-inject some components and call it My Master Canvas. Hi Ben, thanks for all the work you’ve done on your Canvas Native Blank Template it’s been exactly what I needed to install a landing page on my existing domain. I wanted to ask – is there any way that I can install a contact form on your blank canvas? Thanks in advance. Hi, I built the BikeTour page from one of your other videos and used the WP 2016 child theme. It was instructed in the video to choose ‘full width page’. At the end of it, I ended up with the white Word Press header including the site name on top of the Elementor page I’ve built. Followed your instructions in this video and when I select ‘Elementor canvas’, it disappears (great). When I select ‘Elementor Full Width’, the WP header appears again. When I switch to the standard ‘Full Width Page’, the header and the side column from the 2016 theme appear. Is there a way to get rid of this header in ‘Elementor Full Width’? Hi Pieter, it’s not possible to remove the header in a full-width layout. If you want to personalize your header, you can do it with Elementor Pro. Somewhat new to all this. Would it be possible to copy/rename the canvas template and use on certain pages so I could hook in a style sheet to all pages where I use the it? Thoughts on how to? Where is this famous Canvas? I can’t find it!! This is the best page builder of the decade! You rock! When building a Product page Template, Elementor stops working as blank canvas – the native WordPress theme messes it all up. Is it possible to disable the native WP theme in Elementor templates? When switching to Elementor Canvas, the menu on the home page is all normal. But when you add more pages to them, the Header or menu is hidden, and I can not make it appear.